Kids are overwhelmed when they go to Disneyland. A wave of excitement pours over them after passing through the hallowed gates and little humans under the age of 10 are reduced to staring in drop-jawed amazement as they try to absorb all the fantastic sounds and colors at once. 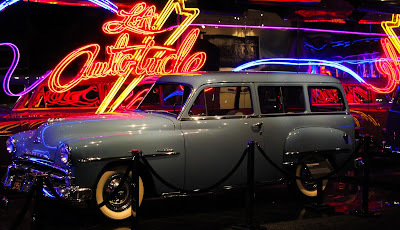 It's very much the same thing when a car enthusiast visits the Petersen Automotive Museum in Los Angeles. 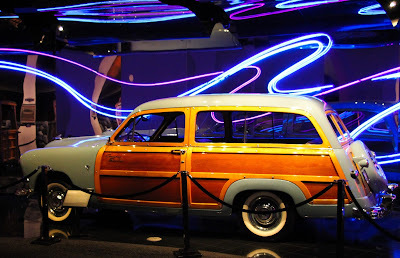 Before we go much further it should be explained that the Petersen Automotive Museum is essentially comprised of three layers. On the first floor you have a permanent exhibit that shows the evolution of the LA streetscape from muddy paths traveled by horse and carriages to the over-crowded network that it is today. The two station wagons swathed in neon light can be found there. The second floor features "rotating exhibits" which are changed out every few months. 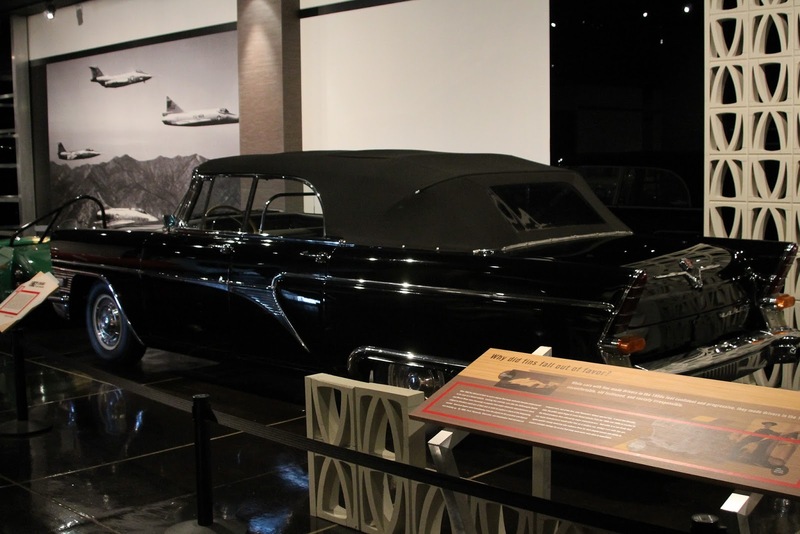 During the time of our visit, the second floor housed several different collections focusing on fins, pickup trucks, movie cars, alternative fuel and more. And thirdly, we have the vault. The vault is the best part of the whole museum and we're not even allowed to show it to you. But more on that subject later on. Also found on the first floor was a comparison of a modern Indy car with one from the days of leather helmets and steel cajones. Naturally, that's the one we're interested in. 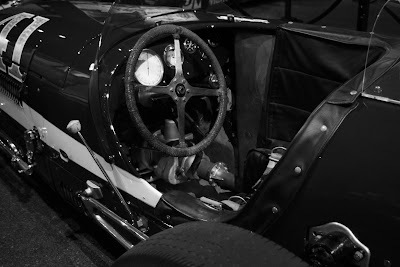 Indy cars have always been an interesting mix of circle track sprint car and high tech formula one. One could assume that sitting next to a whirring prop-shaft at 150 mph with no seat belt is an awakening experience. 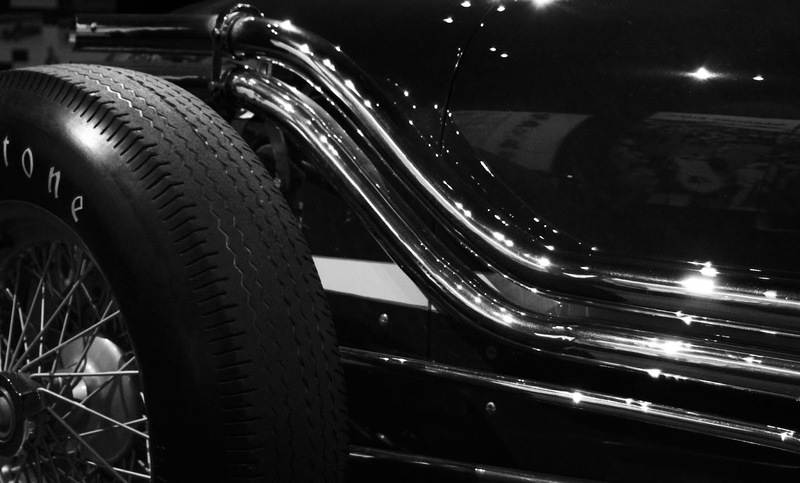 For better or worse, safety has come a long way since these barbaric racing cars. And from the first floor we descended into the Vault. If the contents of the first floor stun you then the contents of the vast basement will put you into a state of shock. The list of cars held in the Vault reads like a greatest list from the best manufacturers. 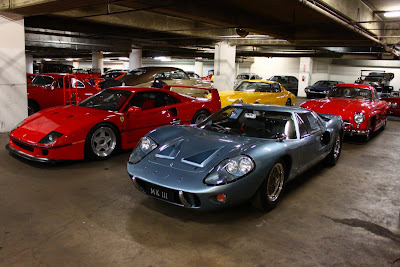 Elvis' Pantera, a 1952 Ferrari Barchetta gifted from Mr. Ferrari to Mr. Ford, the incredible "round door" Rolls Royce and multiple Duesenbergs all reside in the vast catacombs beneath the Petersen. They don't allow photography in the Vault (My guess is to keep the tours short and free of the constant sounds of camera shutters) so these pictures had to be grabbed from elsewhere. One could spend hours wandering the collection but the only way in is to pay for a guided 90 minute tour. At $25 per person on top of the price of admission, it's not cheap, but if the sight of a Duesenberg quickens your pulse, it could be the best $25 you ever spend. Eyes still watering from the Vault, we continued upwards to the second floor. This spunky looking 1951 Crosley Skorpion was displayed as part of a rather large exhibit dedicated to automotive tail-fins. 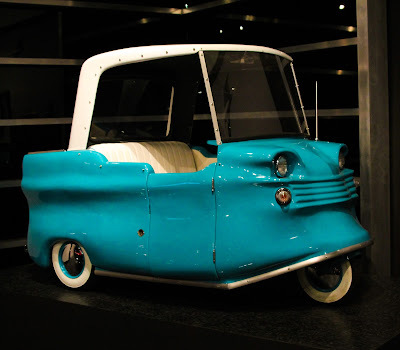 The diminutive little Crosley straddled the line between micro-car and sports-car and was one of the first fiberglass bodied production cars in the world. In the opposite corner of the room (and an opposite end of the automotive spectrum) was the imposing Russian GAZ Chaika. Festooned with ostentatious chrome and prominent fins, the gargantuan Chaika, no doubt, stood out among contemporary Soviet vehicles like the humble Lada. These cars were mostly used by government officials and rarely owned by common citizens. It's an intriguing car to look at today but nobody wanted a black Chaika to pull up to their apartment in the middle of the night when these were new. 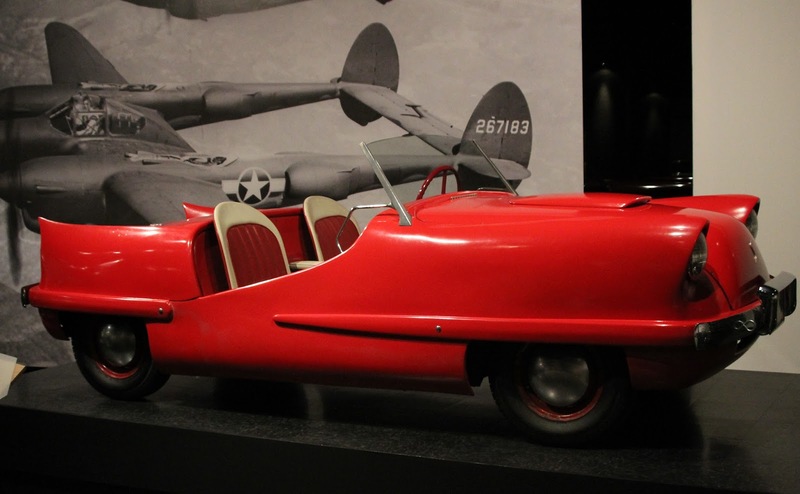 Looking like it escaped from the scene of Pixar's The Incredibles, this bizarre little three-wheeler could only have come from the '50's. It was fairly common in those times for fiberglass bodied micro-cars to be advertised and sold on a mail order basis for people to assemble themselves. 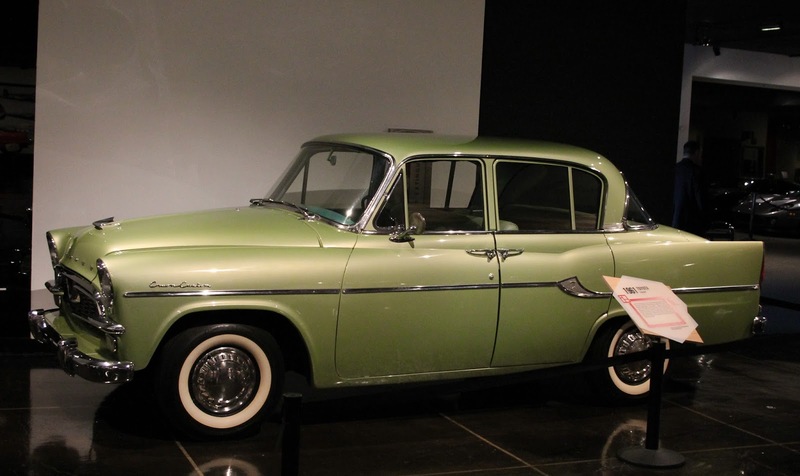 The "Fin" hall also housed the interestingly named Toyopet Crown sedan. The little Toyopet was hardly a sales success as the car wasn't far too small and under-powered for American roads. Stashed away in an adjacent hall, was an impressive collection of off road racers. Highlights included the very first Meyers Manx (Pictured at left) and Ivan "Iron Man" Stewart's Toyota race truck. How's that for progress from the timid little Toyopet? The incredible Bugatti EB110 was just sitting quietly in a hallway. This amazingly complex '90's supercar is powered by a not-so-quiet quad turbo, 60 valve, 3.5 liter V12 making 553 horsepower. Top speed is a staggering 217 mph. These amazing supercars were more than slightly overshadowed by the contemporary McLaren F1. Which one would you rather have? The photography may be lacklucter but the car is a very worthy subject. And that subject would be the 1959 Ol Yaller Mark III. It might look like a home brew race car but that's because it's exactly that. Hollywood based hot rodder, Max Balchowski built this Buick powered beast in his garage to win races. This car set track records at Pamona Speedway and terrorized Maseratis and Ferraris on the track. Why can't motorsport have more home-brew heroes like Max? Early Powells featured bumpers made from oak! Also looking very pieced together is this Powell pickup truck. These Powells were simple trucks and their bodies were designed with very few curves for easy tooling and production. An interesting feature of the pickup is that it features a long tube for storing fishing poles between the inner and outer walls of the right bedside. Decades later lockable inner bed storage is a selling feature on full-size trucks but I doubt any Ram Box can hold a fly rod! A Dodge Power Wagon (Still one of the most evocative names of all time) was flexing its muscles just a few steps from the Powell. Power Wagons have always been capable off-roaders but the ingenious swivel frame these beasts were part bison and part mountain goat. There are some videos of this thing in action on YouTube and they are definitely worth your time. This cute little Datsun pickup is really the mammal to the Power Wagon's dinosaur. These tough and tiny trucks sold slowly at first but were hot commodities by the early '80's as fuel prices continued their march upwards. A classic Pep Boys sign. How could you not trust your car to these three? 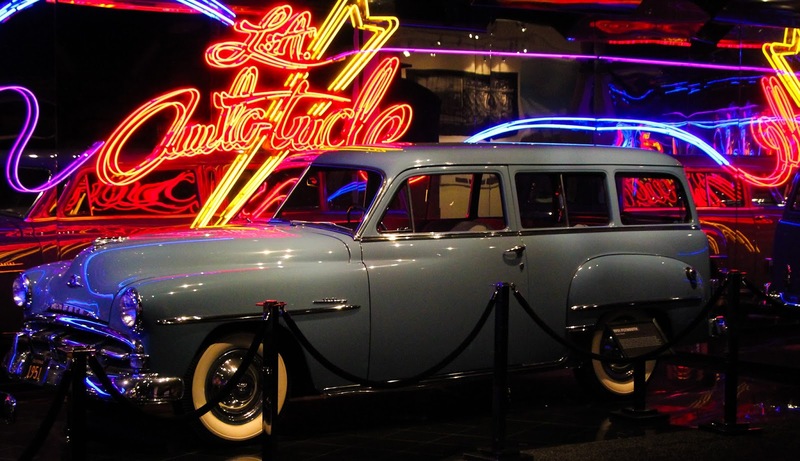 It would be easy to call the Petersen Museum an automotive ark; but it's actually more than that. The Petersen is a dynamic place. Due to the rotating nature of the exhibits, a different experience awaits visitors every few months. 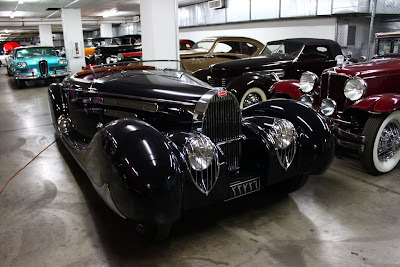 So if you find yourself in LA with time to kill, divert from Disneyland for a day and get lost in the depths of the Petersen.